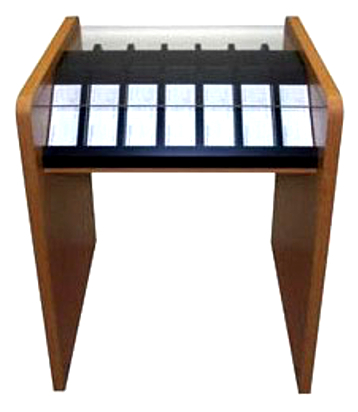 Two-sided check desk, shown in golden oak, with optional literature display. It has a full acrylic writing top, a slant-back laminate literature case with 14 compartments, and sturdy full-width laminate ends with radius corners. Choice of ten colors: red mahogany, cherry, golden oak, walnut, light oak, colonial, black, gray, silver and gold. Optional literature holder, sold separately, is a 2-sided laminate display with 14 clear acrylic pockets for 4" x 9" brochures. 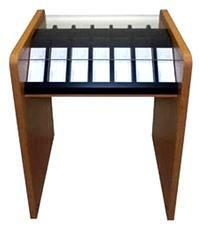 Dimensions: 43-1/2" H x 37" W x 27" D.
Two-sided check desk, shown in golden oak, with optional literature display. It has a full acrylic writing top, a slant-back laminate literature case with 14 compartments, and sturdy full-width laminate ends with radius corners. Choice of 10 finish colors.